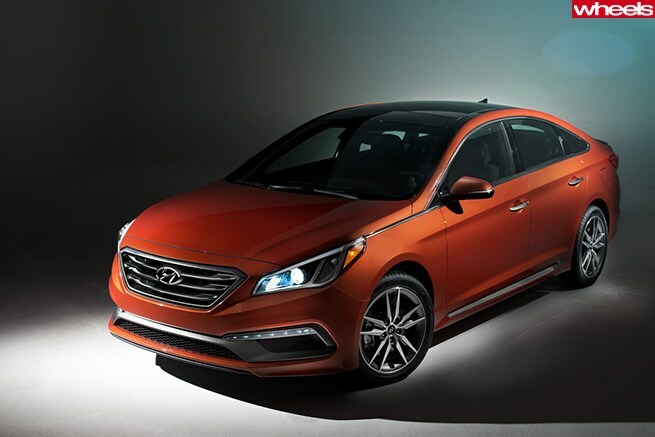 Hyundai is looking at a high-performance sports version of the new Sonata – due for Australian launch in August/September – to differentiate it from its mid-size rivals. Powered by a slightly detuned version of the turbo engine that powered the previous Sonata in the US, the new seventh-generation model features a 183kW/340Nm 2.0-litre turbo engine mated to either a six-speed manual or six-speed automatic, though the auto is expected to get more ratios during the life cycle of the new model. Hyundai says a small reduction in engine output makes the car more responsive at low revs. Known as the Sonata Sport 2.0T in the US, the performance version would likely be called SR in Australia, and was developed at the Nurburgring. Yes, Sonata and the ‘ring in the same sentence: how things have changed at Hyundai. Bigger front brakes, four exhausts, a specific suspension tune – developed locally by Hyundai Australia – a different steering wheel, paddle shifters, and racy orange stitching on the seats, doors, and steering wheel are among the changes expected on the SR.
Entry-level models come with a 139kW 2.4-litre direct injection four, similar to the engine that powered the previous Sonata, called i45 in Australia. A claimed drag coefficient of 0.27 is said to be the lowest for any non-hybrid mid-sized car. Inside, the cabin is so roomy it’s rated a ‘large’ car by the EPA, the US agency in charge of fuel economy and emissions. A wide range of safety and technology features are offered in the US and many are anticipated to be available on Australian cars. Radar cruise control, blind spot detection, and rear cross traffic alert are all available. Digital radio, Bluetooth and full iPod integration are standard in the US while navigation and a 400-watt premium audio system are optional. If you specify satellite navigation, Apple’s “Eyes Free” Siri integration is also fitted. For even further iPhone integration, Apple’s CarPlay will be made available later in the year.